I’m a huge fan of Japanese whisky. I always have been ever since I first tasted Yamazaki 12yo a few years ago. Having moved from there on to various Hanyus, Hakushus, Chichibus, Yoichis and Miyagikyos and even the odd Karuizawa, my eyes were rapidly opened to the world of Japanese whisky, and world whisky at large. What struck me was the consistently high quality of Japanese whisky, not bad for an industry which can trace its commercial roots back to the relatively recent days of the 1920s. If you want to read a bit more about the history of the Japanese whisky industry, our friends at Nonjatta have written several wonderful pieces on the ‘father’ of the Japanese industry, Masataka Taketsuru (just click here and here). Although best known for founding Nikka (called Dainipponkaju back then), Taketsuru was heavily involved in the building of Yamazaki distillery in 1923, a project which was overseen by Suntory founder, Shinjiro Torii. Indeed it’s Torii’s great-grandson, Shingo Torii, who now leads the blending team at Nikka and who is essentially responsible for the newest permanent addition to the Hibiki line up: Hibiki Japanese Harmony. Taking inspiration from the harmony between people and nature in Japan, Harmony is a blend of 10 different expressions from Suntory’s three distilleries, Yamazaki, Hakushu and Chita, and includes whisky which has been matured in rare Japanese Mizunara Oak. 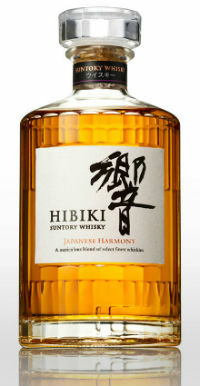 I thoroughly enjoy the 12yo Hibiki, so how will Harmony fare? Nose: Lychee, pineapple, banana foam sweets, Crunchie Bars, Battenberg cake, lemon zest and floral notes are underpinned by some sawdust and old chopped logs. Palate: Runny honey and orange oil to begin, then there’s white chocolate mice, butterscotch, caramel shortbread, Danish pastries and some juicy oak. Finish: Soft wood spice lingers along with some toffee and oak staves. Overall: I suppose £50+ may be a bit much for some people to stomach considering this is an NAS blend, particularly when you can get 50cl of Hibiki 12yo for £36.83 (which equates to £51.56 for 70cl). Having said that, the liquid is fantastic, if a bit lighter than the 12yo, and it does live up to the price tag in my opinion. A beautifully balanced blend and a great alternative to the 12yo. This entry was posted	on Wednesday, August 12th, 2015 at 6:02 pm	and is filed under Reviews. You can follow any responses to this entry through the RSS 2.0 feed. Responses are currently closed, but you can trackback from your own site.